At least 48 hostages are now thought to have died in a four-day siege at an Algerian gas plant, as reports say that 25 bodies found at the complex on Sunday were all those of captives. It had initially been unclear whether the bodies found were those of hostage-takers or staff at the facility. A search is continuing at the In Amenas gas plant, where as many as 20 hostages remain unaccounted for. Five suspected Islamist attackers were reportedly arrested on Sunday. The Algerian authorities had said on Saturday that all 32 hostage-takers had been killed. The suspected organiser of the attack, Mokhtar Belmokhtar, said 40 militants had taken part. The siege ended when troops mounted an assault on Saturday, saying the militants had begun killing foreign hostages. Western leaders condemned the attack with French Defence Minister Jean-Yves Le Drian describing it as an "act of war". The plant, which is responsible for more than a tenth of Algeria's overall gas output, is expected to resume production by Tuesday, Algeria's Energy Minister Youcef Yousfi said. Prime Minister Abdelmalek Sellal is due to give a new conference about the attack later on Monday. The energy minister also pledged to boost security at energy installations but insisted it was "out of the question to allow foreign security forces to handle the security" of Algerian oil facilities. During a visit to the affected plant on Sunday, Mr Yousfi said it would resume production within two days. Security forces reportedly discovered the bodies of 25 hostages as they searched the complex for booby-traps and mines. The militants had threatened to blow up the site and kill their hostages, officials said. Belmokhtar, who is not thought to have been among the actual attackers, said his group had carried out the attack. He was speaking in a video message carried by the Mauritanian website Sahara Media. The website said the video had been recorded on 17 January while the siege was still going on but not posted on the website. It shows Belmokhtar, who has convictions in absentia for murder, kidnapping and terrorism, saying he was prepared to negotiate with Western and Algerian leaders if operations against Islamists in Mali were stopped. 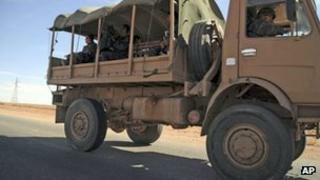 The crisis began on Wednesday when militants attacked two buses carrying foreign workers to the remote site in south-eastern Algeria. A Briton and an Algerian died in the incident. The militants then took expatriates hostage at the complex, which was quickly surrounded by the Algerian army. Algerian state media said later that 685 Algerian workers at the plant had been freed but it is unclear if any Algerians were actually taken hostage, with reports that militants told them they were only targeting non-Muslims. A statement from the kidnappers said the assault on the gas plant had been launched in retaliation for French intervention against Islamist groups in neighbouring Mali. However, France only decided last week to intervene militarily in Mali. Analysts say the assault on the gas facility was well-planned and would have required advance research, as well as possibly inside help. Bus attack: 05:00 local time 16 January: Heavily armed gunmen attack two buses carrying gas field workers towards In Amenas airfield. A Briton and an Algerian die in the fighting. Army attacks: 12:00 (13:00 GMT) 17 January: Algerian forces attack as militants try to move some of their captives from the facility. Reports say some hostages escape, but others are killed. Final assault: The Algerians ended the raid on 19 January, killing the last 11 captors after they had killed seven hostages, state media reported. At least 48 hostages and 32 militants in total are now believed to have died. Are you, or is someone you know, affected by the issues in this story? Send us your experiences using the form below.